I do believe that most Indonesian know Chairil Anwar. He stands like a great monolith in Indonesian poetry world. 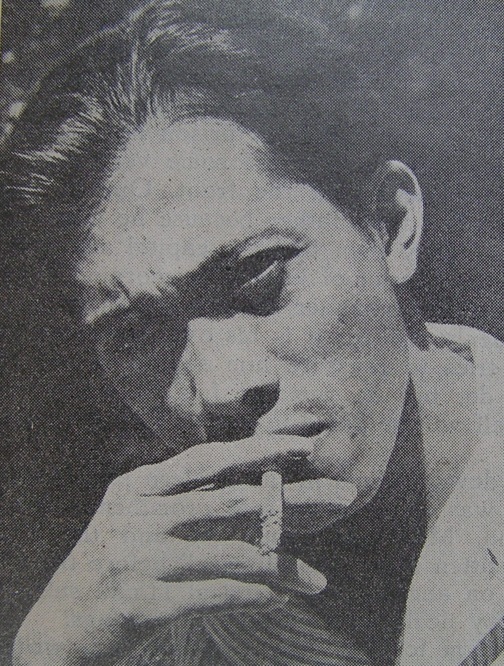 Chairil Anwar was born in Medan. His biggest contribution to Indonesia is that he made Indonesian poetry into a new kind of writing style. Chairil Anwar was great because he had magical power within his writings. Though some people do not respect C.A. because of plagiarism issues but H.B. Jassin made an apologia for this man; a book entitled Chairil Anwar Penyair Angkatan 45. And, I do agree with H.B. Jassin that this C.A. has his own style that we cannot find in others. Considering H.B. Jassin’s apologia as my main reference to pick C.A’s authentic poem, I will review one of those C.A’s authentic poems to show C.A’s quality. dan kini tanah dan air tidur hilang ombak. Lets take a look at the first verse. The first verse gives us a gloomy nuance. We can imagine how the situation is. It is silence that holds the time. There is no activity on that haven. The warehouse and old cabin, both, are left undone. While the ropes and the line of spars don’t have anything to say since the boats are not sailing. Doesn’t this situation drive us to a picture of sadness? And, this poem goes this way; A gloomy situation, the silent haven, and the frustrating boats. C.A. wrote the boats as having human characteristic. The frustrating boats; they make motions as usual but they are stagnant. Look how brilliant this C.A. created the first verse. This verse starts with a withering sentence ini kali tidak ada yang mencari cinta and then ends with menghembus diri dalam mempercaya mau berpaut. In short, everything seems devastating. Nothing has changed actually; it is still the same sea, the same harbor, and other things are unaltered, but they, for a reason, cannot act normally. Still, they, metaphorically described, hardly believe that a day like this could happen. The second verse does add the gloom. This C.A. gives us two verses which describe the situation of a place. This is a place where we cant see any activity or any man. It is just like a painting but it has more power. The reason is because here we read this line: Ada juga kelepak elang. A silence which produces such situation; its creepy. A silence in which you can hear the motion of eagle’s wings. Yes, you see the eagle but to hear his wings? Isnt it so silent? Remember that we have a picture of a harbor without any activity. Then we are faced with gerimis. Yes, sprinkle is huge different with cats and dogs. ; though we know that cats and dogs will give a perfect melancholy, but you won’t hear the motion of eagle’s wings if it is pouring. C.A. puts another line: menyinggung muram. Okay then, let us put focus on Ada juga kelepak elang (there is also the sound of eagle’s wings) [as if] menyinggung muram (it gives tongue to this gloomy silence). It means that the silence is perfectly described with the presence of kelepak elang. Desir hari lari berenang menemu bujuk pangkal akanan gives us an information in a metaphorical way. We can say in other words with: the day walks into its decay. No movement[,] and now the land and the sea sleep + lose waves. No movement[,] and now the land sleeps and the sea loses waves. This line may be interpreted as: its so dark so we cant differentiate where the land is or where the sea is. Both of them lose their existences. So we move to the next verse. Tiada lagi. What does this mean? This verse is started with tiada lagi (there is nothing or there is no one or there is nothing left?). It is indeed very short line, too short in fact. We get three possible meanings. If we take this line as there is nothing, so it will probably reads as there is nothing to see anymore on this harbor because its so dark. If we take this line as there is no one, so we may conclude that C.A. wanted to tell us: The harbor has no activity. It is so silent there and he cant find anyone there. But if we take this line as there is nothing left, well it will drive us into another kind of interpretation. I will explain it later. Yes, the man says that he is alone. All those previous lines before this have said no one there and now we are given a man and loneliness. What makes this poem as a defamiliarization product? Lets take a close reading once again onto this poem. At first, we are given a “lonely” harbor and then the most important aspect within this poem, or the man, is introduced later on. The poem shocks us by the arrangement of such. The most important aspect, the man, is only described in one verse. Another ostranenie generation is shown by the use of enjambement. The (i) line shows us two things; Aku yang berjalan menyisir semenanjung (I am walking on this shoreline) and Aku yang masih pengap harap (I am hopeless). It is different from the (ii) line. In conclusion, this poem tells us about a devastating situation. The prologue was built by C.A. in 2 verses, while the climax was described in the last verse. The climax itself doesnt offer us a solution. It stimulates us a question; “The man can accept his bad luck at the fourth shoreline?” or “The man is asking himself whether he can overcome his misfortune at the fourth shoreline?”. Overall, this poem is a great poem. This is, indeed, a masterpiece from C.A. It justifies the greatness of C.A. PS: This writing is inspired by the comment of A. Teeuw on the same poem from Chairil Anwar. Revisiting Chairil Anwar by Dipa Nugraha is licensed under a Creative Commons Attribution-NonCommercial-NoDerivs 3.0 Unported License. Based on a work at dipanugraha.blog.com. This entry was posted in Essay and tagged Chairil Anwar, Senja di Pelabuhan Kecil. Bookmark the permalink. The works in this blog are licensed under a Creative Commons Attribution-NonCommercial-NoDerivatives 4.0 International License.